Valentines Day relationship status – COMPLICATED – We hear you girls! This year we wanted to celebrate the meaning of valentines day by focusing on self love! One side of Ibiza you may not be familiar with is the magical healing and spiritual side of the island. Ibiza has always attracted healers and has a way to soothe your soul! When we are not working or partying up a storm in Ibiza we love to connect with nature and look after ourselves. Ibiza is the perfect place to do just that! This is our Ibiza version of eat, pray, love just for you….!! Get your downward dog on and practice yoga at La Galeria Elefante . This intimate studio is situated in the beautiful garden of La Galeria Elefante Concept Store and is open all year round, offering sessions for health and well-being to adults and children of all ages. Located in the centre of the island of Ibiza, close to the village of Santa Gertrudis, it is easily accessible from many routes. Firstly treat yourself to the divine surroundings of the atzaro spa and soak all the magic Ibiza has to offer Atzaró Agroturismo Hotel and Spa is one of the most prestigious hotels on Ibiza and one of Europe’s leading luxury destinations. 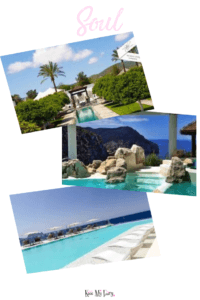 Situated on thirteen hectares of fragrant orange groves and abundant gardens in the heart of the island! Secondly head to the hills of San Miguel and find this stunning spa which offers all the usual treatments and some thermal pools with views to die for! Enjoy the relaxing atmosphere in a tranquil place, dedicated to your spiritual & physical well-being. It is located in the luxury resort the Hacienda Na Xamena, Ibiza, in the northern hills of Ibiza. Firstly The Skinny Kitchen, a fresh meeting place for all day dining. Think delicious coffee in the morning, superfood cocktails and good vibes in the evening and a whole lot of healthy food in-between. At Skinny Kitchen they love to create dishes using high quality ingredients, their food is clean, natural and contains no nasty additives. Above all they cater for many diets from vegan to gluten free and so you know exactly what you are putting into your body! They want to help you eat well, track your macros and stick to your goals. 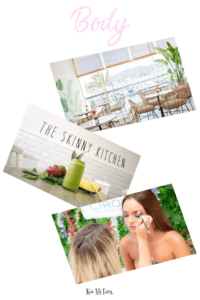 If your lifestyle is all about healthy food, The Skinny Kitchen is the place for you!!! Similarly Passion Cafe, located in seven locations across Ibiza. The Passion focus is very much on vegan, vegetarian, macrobiotic and raw cuisine but they believe in the motto ‘love all and serve all’ so you can also find great fish and chicken options on our menus. The Passion Café philosophy is to create good, natural, wholesome food using the very best quality ingredients we can find. Our food is unadulterated and unadorned. They source locally grown produce as much as we can and go organic whenever possible. Moreover unwind and reconnect with nature. Take in the summer breeze, listen to the captivating sounds of the ocean and take part in the best, FREE activities Ibiza has to offer! Firstly whilst Ibiza sunsets get the most press, we can tell you hand on heart that there is something magical about an Ibiza sunrise! Either catch it on your way home with friends or rise early and head down to Ibiza Town, Ses Salines or Es Cavelletts. Furthermore you will often find us getting up before dawn and hiking up to the highest point (Sa Talaia de Sant Josep), down to Atlantis or in Ses Salines national park. We promise there is no better way to start the day! Ibizas colours and views leave your heart feeling full of love and gratitude to be in such a beautiful place! Finally proof that endings can be beautiful too!!!!! Soak up the unimaginable beauty of an ibiza sunset!!! 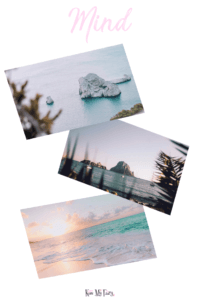 Either join the crowds at Cafe Mambo and Sunset Ashram or head out of town and find heavens gate or the famous view point of Es Vedra for a more spiritual end to the day. In conclusion to our Ibiza EAT, PRAY, LOVE we want to send you some love with a DISCOUNT of 30% off our products.Use code LOVEYOU30 whilst stocks last!